Coconut Sauce is the Asian version of whipped cream. It’s a delicious, creamy and sweet topping for many Asian desserts. This is a fundamental recipe every cook should master because you’ll use it again and again. My recipe is not super sweet and I add a bit of salt to balance the sugar. Feel free to add more sugar if you like it sweeter. Enjoy! Try the coconut sauce with the Coconut Sticky Rice and Mango and the Pandan Sticky Rice. If you enjoy this recipe, you may also like: Steamed Banana Cake (Banh Chuoi Hap), Rice Pudding with Black-Eyed Peas (Che Dau Trang) and Sweet Mung Bean Pudding (Che Tao Soan, Che Dau Xanh). In a saucepan over medium heat, whisk together all ingredients combining well. Continue stirring as the sauce warms. The sauce starts to thicken after 2 minutes. As soon as the sauce starts to bubble, turn off the heat and continue stirring for another minute. Serve warm or at room temperature with your favorite desserts. Does coconut cream work OK too? Yes, coconut cream works. Enjoy! Can this sauce be used over the top of a homemade Thai lemon coconut rice with chicken. I think if you dilute the sauce with a bit more water, it would work well for your savory Thai dish. It sounds so delish! Can I use this sauce on battered shrimp ? Does it need to be refrigerated if not used immediately? Hi, the sauce can be left at room temperature during the day it is made but should be refrigerated at the end of the day. Hope that helps! can you add some shredded coconut to the coconut sauce? or would that make the sauce break down? If you consume the sauce within the day, adding shredded coconut will be just fine. If you refrigerate the sauce, it will break down. Enjoy! How long would this last in the refrigerator? No more than a few days. The sauces starts to break-down once refrigerated. Is it okay to replace tapioca starch with cornstarch?? Yes, corn starch would work just fine. Enjoy the recipe. 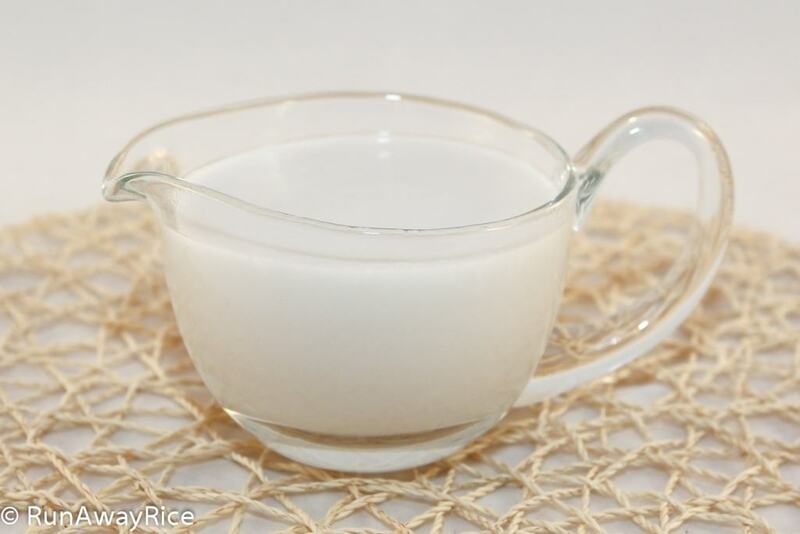 Reduced or low-fat coconut milk is just fine. The tapioca starch will thicken it up and you can always add it bit more it you like a thicker sauce. Looks like a easy recipe and just what I am looking for, thank you! Hi Mary, I always have coconut milk handy in my cupboard to make this sauce. It’s a simple, delicious topping that works well with so many desserts.